Clifton Forge, VA (April 8, 2019) - SonaBank of Clifton Forge is a sponsor for the 23rd Annual Alleghany Highlands Bike Rodeo which will take place on Saturday, May 4th beginning at 10 a.m. Activities will take place at the Jackson River Sports Complex in Covington. 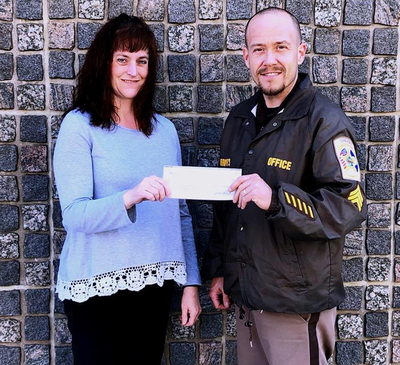 Kim Unroe of Sona Bank presents a check to Sgt. Chris Fisher of the Alleghany County Sheriff's Office.